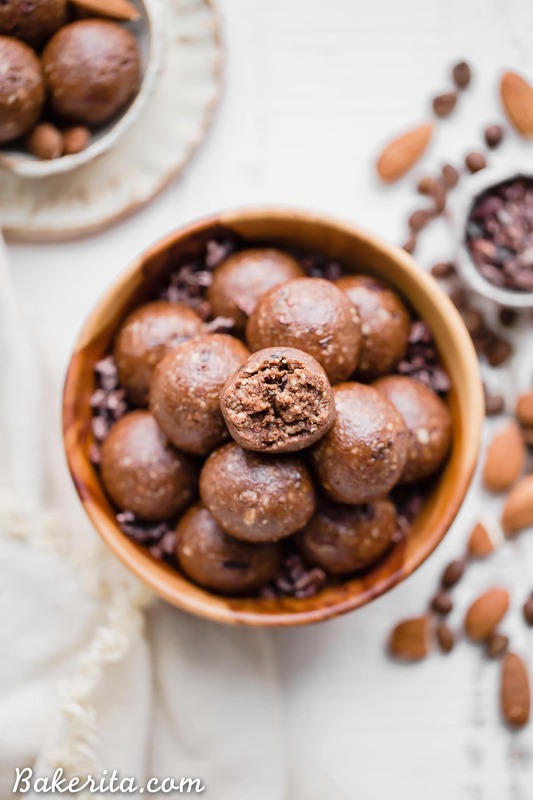 These Mocha Almond Fat Balls are chocolatey, rich, and full of healthy fats to help give you a little energy boost and keep you fueled. They’re gluten-free, paleo, vegan and keto-friendly. 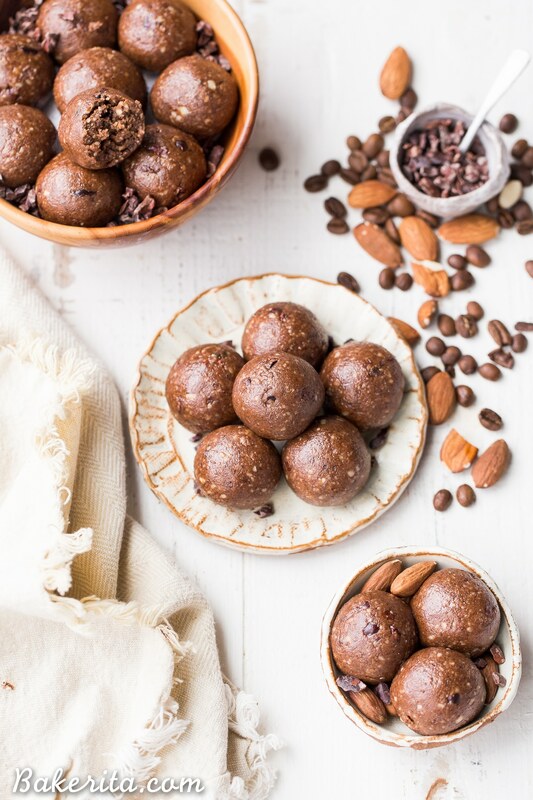 I’ve got a few fat balls on the site that are pretty swoon-worthy – the classic nutty coconut fat balls, the cacao peanut butter fat balls, the pecan pie fat balls, and the strawberry vanilla energy balls…but it was time for someone new to join the mix. After these Mocha Almond Fudge Bars, I was feeling inspired/in love with the mocha almond fudge flavors. So, why not make it into a healthier, super-low-sugar, high-fat energy ball?! 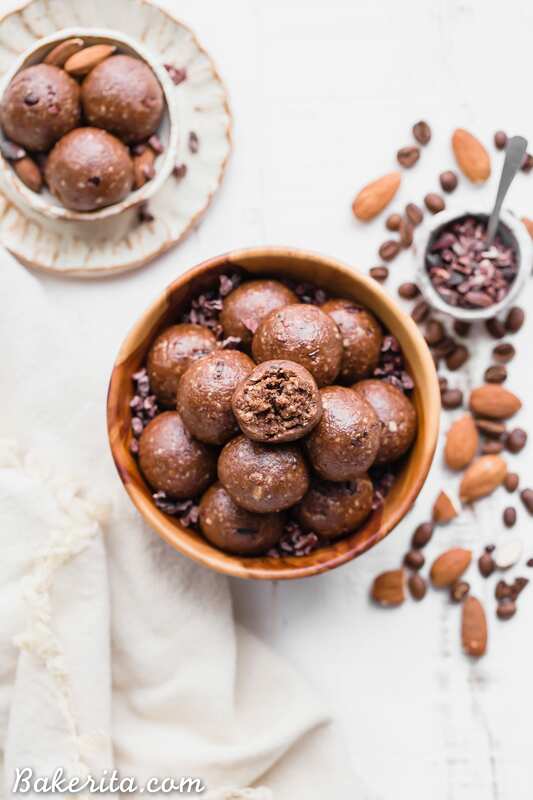 These Mocha Almond Fat Balls have less than 10 ingredients and you can make them in just 10 minutes. I use my Vitamix, but you can also use a food processor if that’s what you have (it might even be easier in a food processor, I just don’t have one to test with!). You just pulse everything together, roll into balls, and you’re done. Doesn’t get much easier than that! So, what’s in these Mocha Almond Fat Balls?! Almonds, almond butter, flax meal, and hemp seeds provide a bunch of healthy fats. 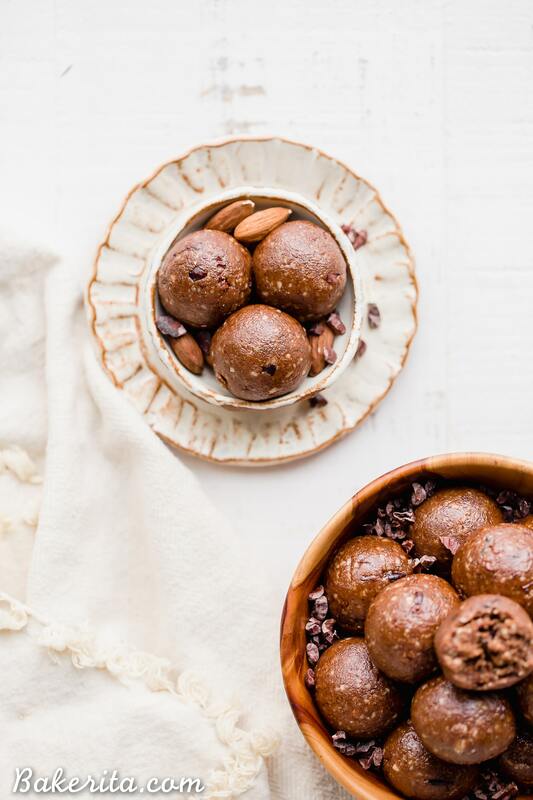 Cacao powder and cacao nibs add a deep chocolatey flavor and make these little balls super rich and decadent. A little maple syrup adds a bit of sweetness. But, you can skip that to keep things whole30 + keto if that’s your diet. To bring that coffee flavor, we turn to espresso powder. I used a full tablespoon of espresso powder for a little espresso punch, but depending on the depth of espresso flavor you’re looking for, you can drop it down to 2 tablespoons or add a teaspoon or two extra :) you do you. 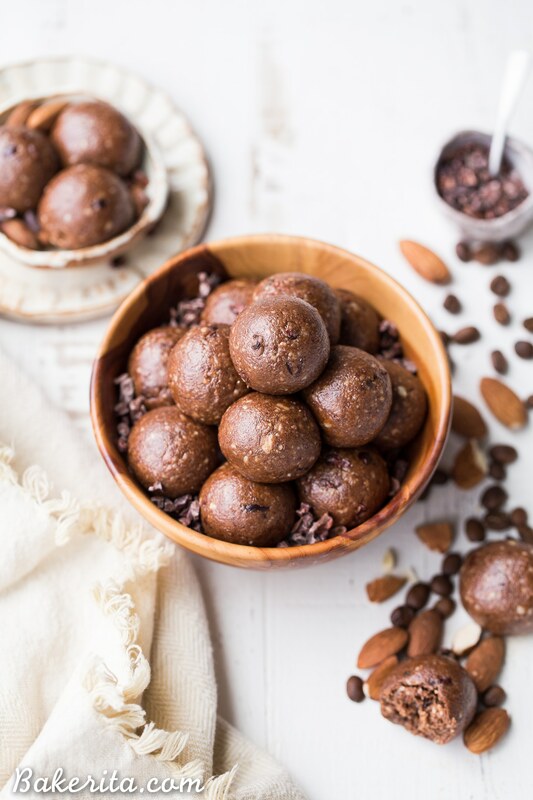 These Mocha Almond Fat Balls are chocolatey, rich, and full of healthy fats to help give you a little energy boost and keep you fueled. They're gluten-free, paleo, vegan and keto-friendly. 2 tablespoons cacao powder use 1 tablespoon if you're skipping the maple syrup so they aren't too dark - unless that's what you prefer! In the bowl of a food processor, combine all of the ingredients except for the cacao nibs. Pulse for about 1-2 minutes, until the mixture starts to break down. It will first become powdery and will stick together, but still be crumbly. Keep processing until the oils start to release a bit and the mixture sticks together easily - just be careful not to over process or you’ll have nut butter. If your mixture seems dry, add the teaspoon of coconut oil to help it come together. Once the mixture is sticking together well, pulse or knead in the cacao nibs to incorporate them. Use a small cookie scoop (I use this one) or a tablespoon scoop to divide the mixture into equal pieces. Use your hands to roll into balls and place on a plate. Refrigerate or freeze. Store in an airtight container zip-top bag in the refrigerator or freezer. Nutritional info is calculated including the maple syrup. Hehe thanks so much for the love, Brittany! These look great! Do you think substituting Stevia for maple syrup would be okay? Hi Daneila, I don’t like/don’t use stevia so I wouldn’t know how much to use, but I don’t see why it wouldn’t work!! :) Enjoy! Can you say what espresso powder (brand) you used?. Hi Michelle, the brand I used is called Medaglia D’Oro – I believe I got it at Trader Joe’s! Hi, I am excited to try this wonderful recipe in few days! I can’t get espresso powder anywhere around me so Im wondering if I can use instant coffee granules or ground coffee as an alternative. And if so should I dissolve in water before I put them? I also have coffee essence similar to vanila extract on hands if that can be an alternative! Please give me your suggestions! Thank you! Hi Laura, instant coffee should work, you just might want to use a little more to get the flavor you want. And no need to dissolve in water. I’m sure the extract would also work well if you wanted to experiment with that :) enjoy! !